While the sub-£799 price range is often linked to the consumer market, more corporate laptops are appearing. 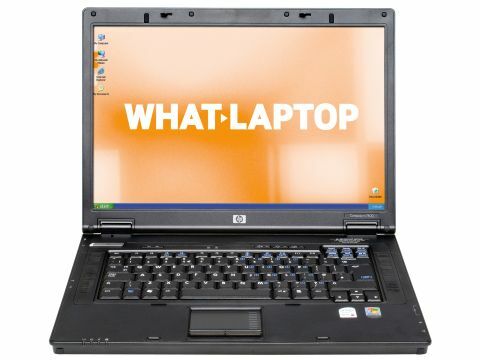 Although identically specified to the consumer systems in this review, the HP Compaq nx7400 (£763 inc. VAT) is a well-built and affordable business laptop. HP is well known for its high-quality designs and, with its strong chassis and corporate appearance, this is no exception. At 2.6kg, this really is portable. With a battery life of 233 minutes, the HP will keep you working for nearly four hours. With a flawless user interface, usability is impressive. The keyboard has a sharp typing action, and the board itself is large and responsive. The mouse buttons are crafted from rubber for increased tactility, and prevent damage to the screen when closed. Two factors set this laptop apart as a corporate system. Firstly, its use of Windows XP Professional provides increased networking and data security features. Secondly, its 15.4-inch screen uses standard TFT technology, as opposed to a glossy Super-TFT coating. Images aren't as bright or vibrant as rival systems. However, the trade-off is a significant reduction in screen reflections. This means you can work in even bright conditions without reduced screen visibility. While the HP is has quite a low specification for the price, performance still managed to impress. Using a dual-core processor from Intel's Core 2 Duo range, there's enough power for any home or office software. Inevitably for a corporate laptop, graphics performance is limited. Older games will run on the HP, but modern gaming is almost impossible. However, this won't hinder most multimedia use, such as video and photo editing, and running complex presentations. For saving data to CD or DVD, a built-in recordable optical drive is fitted. Allowing you to copy to dual-layer DVDs, as much as 8.5GB can be saved to compatible discs. High-speed wireless networks can also be accessed using an integrated 802.11a/b/g Wi-Fi card. Disappointingly, the HP falls far short of its rivals in other areas. With no extra features, such as a media card reader or free software packages, users are left with little other than the basics of a modern laptop, which is hard to justify at this price. With a fantastic user interface and solid business stability, the HP Compaq nx7400 is a great corporate laptop. However, it provides little more, and consumers with a £799 budget can easily find a lot more for their money elsewhere.